CALGARY - It’s a robot designed to bring comfort to little patients at Alberta Children’s Hospital. Four robots are being used to calm children getting injections or other medical procedures by giving high fives, telling jokes and stories or playing music. They are named MEDi (Medicine and Engineering Designing Intelligence), and its creators have programmed it to mimic the actions of a child. A recent study conducted by the Alberta Children’s Hospital and the University of Calgary looked at 57 children between the ages of four and nine. It found those who interacted with the robots reported 50 per cent less pain compared to youngsters who received their vaccination with little or no distraction. Dr. Tanya Beran, professor of community health sciences at the University of Calgary school of medicine, says the study shows the potential and the benefits of using robotics to manage a child's pain during procedures such as getting stitches, blood tests, or fractures. “MEDi can speak in 20 languages and do different kinds of dances, demonstrate different kinds of movements we’d want children to do, tell jokes, stories, tell the child’s favourite story, play music and calming music,” Beran said. 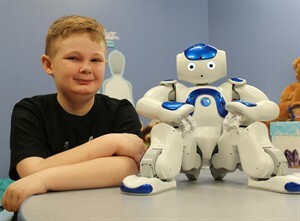 Nine-year-old Aidan Sousa is one of the patients who has been interacting with the robots and already he’s a big fan. “I was pretty excited and surprised to see what he looked like and how kid-friendly he looked,” he said. His mother says Aidan has to go to hospital every two weeks for injections to manage his severe asthma. "All Aidan could talk about after his injection was the robot," said Sheila Sousa. "Not only did it calm him down, but it helped me knowing Aidan was preoccupied and interested in something other than his treatment. It made the entire experience so much easier." Beran and her team are adding applications to MEDi’s programming for such procedures such as blood transfusions, EEG tests and chemotherapy. The developers also are planning to enhance the technology by personalizing the interactions through use of facial recognition software.